My husband needs to be part of a support group for chip lovers. Seriously- the man could sit down and eat an entire bag of chips in one sitting. Don’t get me wrong I love a good chip too, maybe even 1/4 of a bag depending on the mood, but how do you eat an entire bag of chips?? I’ve been told it may be somewhat genetic, lol, he comes from a long line of chip lovers! The bad news for him is we very rarely buy chips anymore. When we do it’s usually because we are going somewhere and were asked to bring them. Why you ask? Well a number of reasons 1. He can’t stop eating them 2. There is 0 nutritional value to them and you can’t pronounce most of the ingredients and 3. They are expensive. When you are on a budget every penny counts. For the same price we can get one bag of chips we could get a bag of apples or 2 lbs of strawberries- something healthy and delicious that our entire family can enjoy! The good news is I love that man very much and I would never want to take something away from him that he loves! So we make our own chips- healthy and delicious with no additives, preservatives or extra fats and/or sugars! 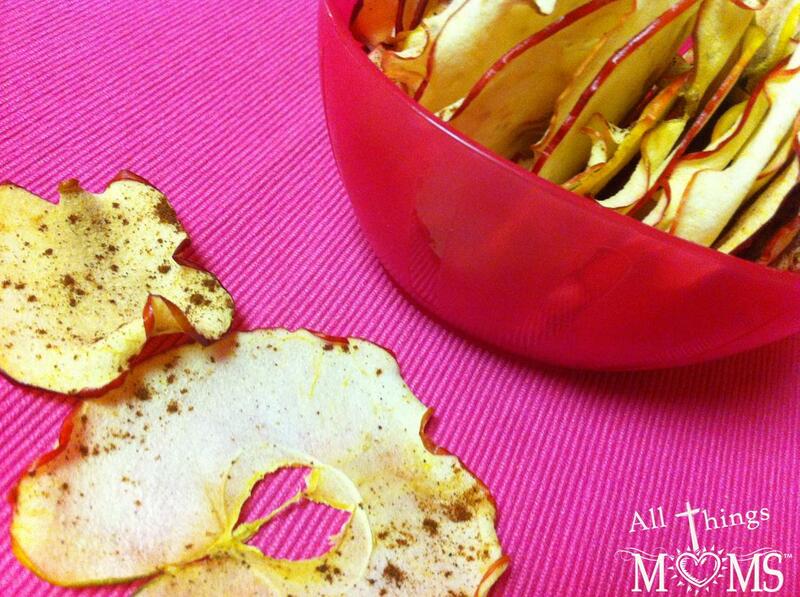 My new favorite is Apple Chips, plain or with a little cinnamon you can’t go wrong! 2. 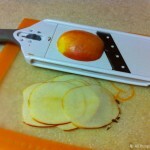 Slice the apples very thin using a mandolin or slicer. I used the PC Simple Slicer on setting 1 which is 1/16 of an inch slices. 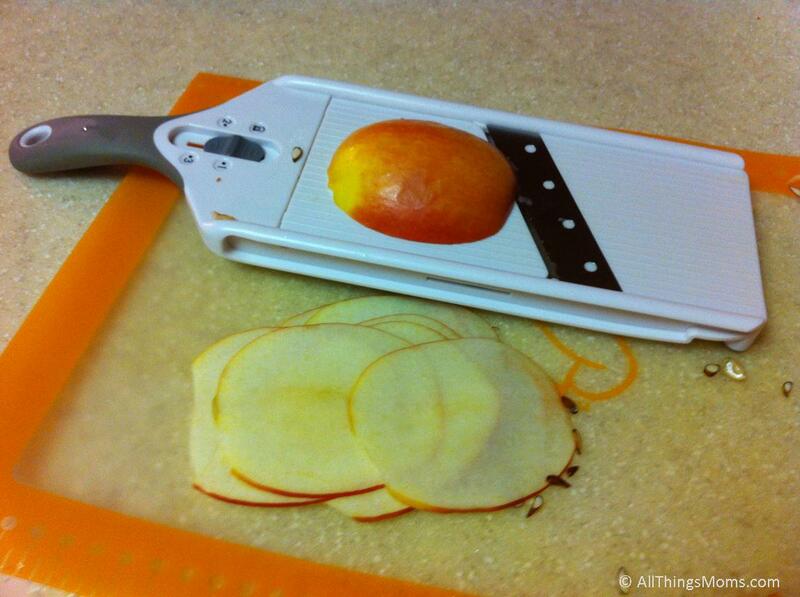 You don’t need to core the apple first because the seeds will fall right out as you slice. 3. 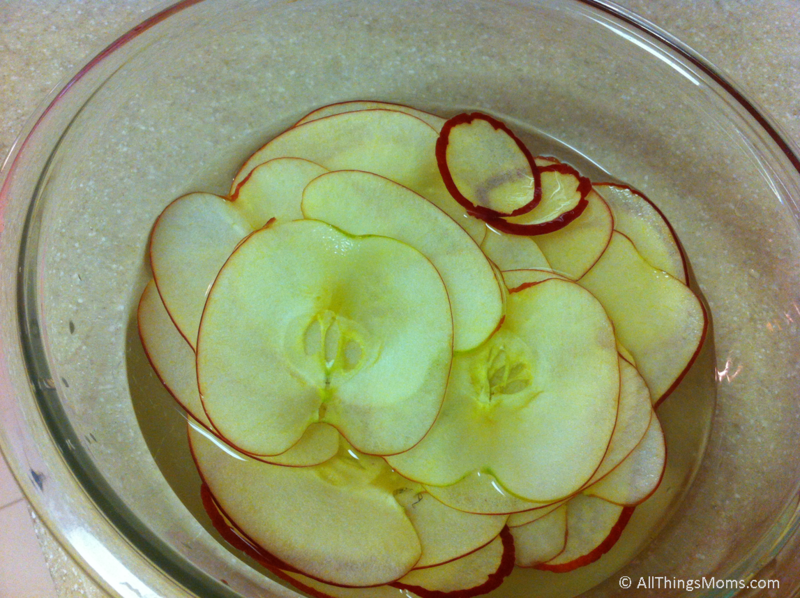 Place the apples into the water and lemon juice. Let them soak at least 30 seconds to a minute. 4. Lay out a clean towel or layer of paper towels. 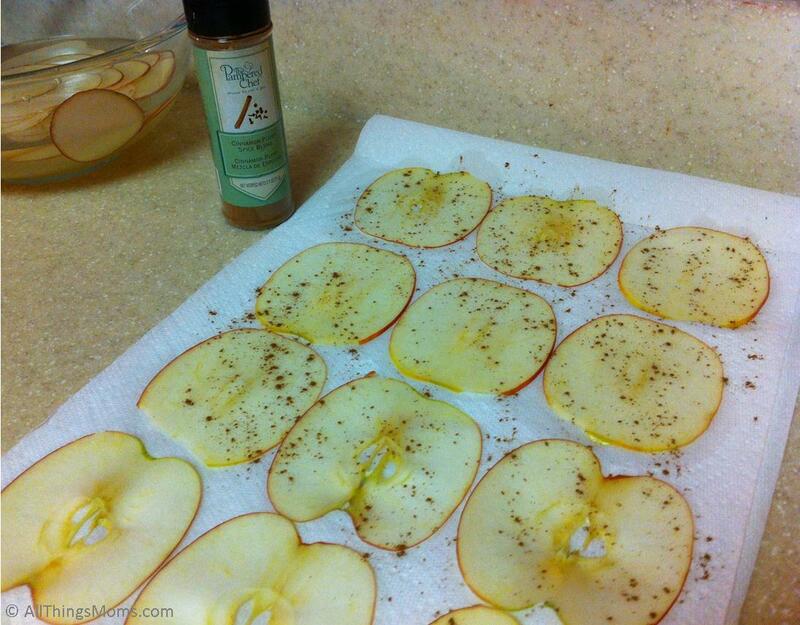 Place the apples on the towels and use another towel/paper towel to pat out any excess moisture. 6. Place a single layer onto the first tray of the Microwave Chip Maker. 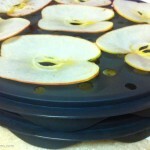 Set the second tray on top and place a single layer of apples on top of it. 7. Place in the microwave for 4 minutes. After 4 minutes swap trays 1 & 2 so the bottom tray is now on top. Microwave for an additional 3-4 minutes until crispy. 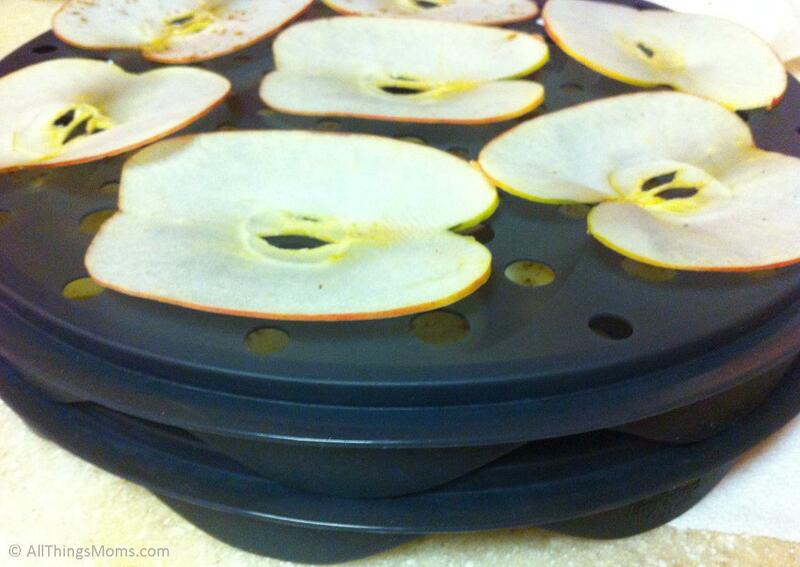 One apple makes 3-4 trays of apple chips. 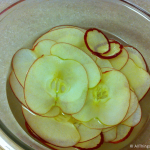 They can be stored in an airtight container for a few days but are best and crispier when enjoyed within 24 hours. If you do not have a Microwave Chip Maker, you can still make these delicious chips it will just take longer. Just follow the steps below. -Preheat your oven to 250 degrees. 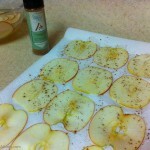 -Place apple slices on a baking sheet in a single layer and bake for 45-60 minutes. 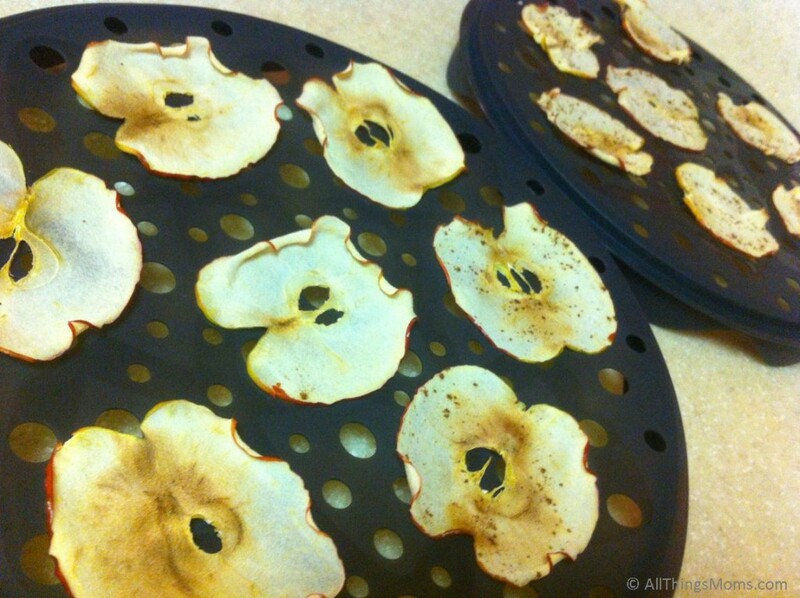 Remove the chips from the oven, flip them over and bake for an additional 45-60 minutes. I have enjoyed these chips cooked both ways! I like using the chip maker just because it saves you so much time and prevents you from having to heat up the house. We also use our chip maker for regular, sweet potato, kale, and spinach chips too! If you don’t have one don’t let that stop you- fall is here it’s getting cooler out and these are definitely worth the time! Enjoy! Ok, I’ve been wanting a mandolin and I’ve yet to make these or other chips bc I haven’t wanted the oven on all day or partially open. Maybe I need to come to one of your pampered chef parties and stock up on all the things you’re always using!